10-panel setup can be arranged a few different ways. 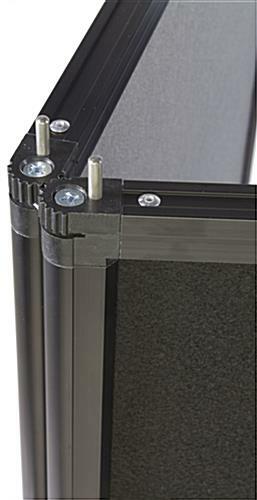 Aluminum frame is stronger & more durable than plastic. 2 fabric colors, (gray on reverse side), is like buying multiple displays at the price of 1! Folding design can be altered into a few different configurations. 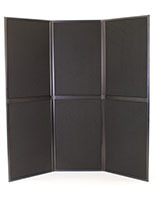 These black display panels create perfect backdrops for within trade show displays and presentations. The folding pop up exhibit, black display panel is made up of ten fabric boards attached together in two sections of five. 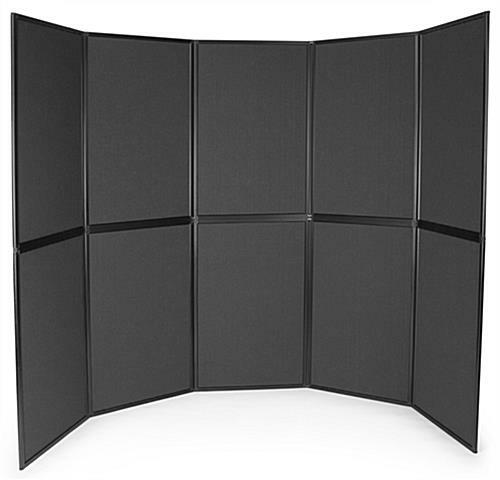 Simply connect the top portion to the bottom, using their folding design to create a unique backdrop presentation. (Please view our images for more details.) 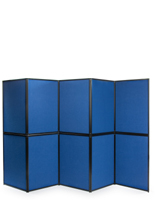 Black display panel, also known as portable trade show display, is equipped with hook and loop receptive fabric so you can easily attach sign frames and literature pockets to an exhibit. 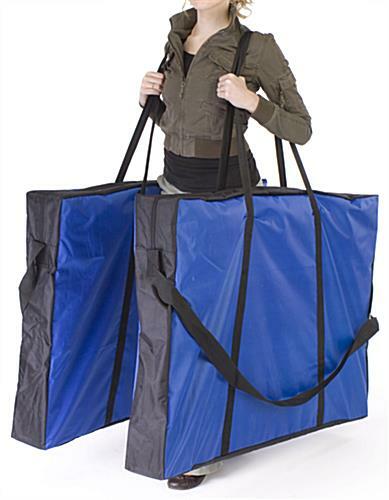 These black display panels are provided with two carrying bags to make it extremely easy to travel with in-between events. 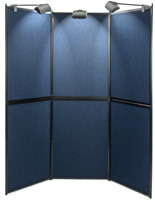 The portable fixtures, panel displays were designed specifically for use within trade show displays; however you may also find them as backdrop exhibits within retail and commercial settings as well! 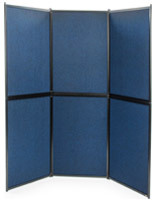 We sell these black display panels each with two fabric color options: black and gray. 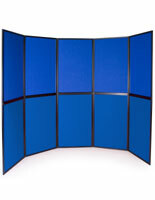 When you buy these panel displays, it's like buying multiple fixtures at the price of one! 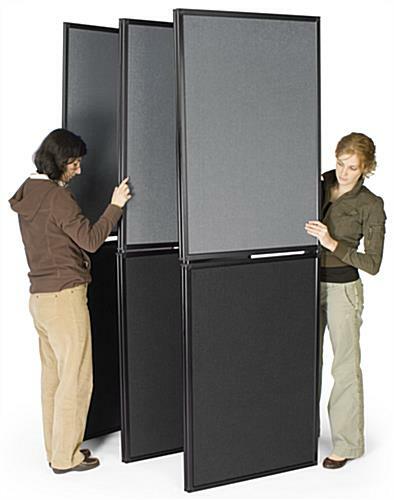 These panel displays may require two or three people for proper assembly. 129.0" x 64.0" x 0.875"
28.0" x 42.0" x 4.0"
This poster display is sturdy, easy to transport, and easy for only two people to assemble. This is a wonderful addition to our traveling education display about rabbit rescue (House Rabbit Society) that we take to various veterinary conferences. It's a little heavy, but splitting it into two bags with shoulder straps makes it manageable. Highly recommend this product! LOVE the photo, Dana! We're so glad the display board works well for veterinary conferences. Thanks so much for taking the time to review. We hope you shop with us (and send us more photos) again soon! Posted one year ago by Dana K.
We've done home shows for 20 yrs. We've always used the old pop up displays. The last ones lasted only 4 years, so I searched the web looking for a better alternative. 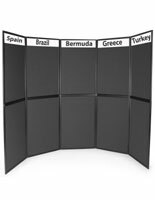 I found the hook and loop display boards for half the price of the pop up displays. After we received them, we set them up to try them out. They're much sturdier than the pop ups and they hold more sales aids because there's more flat surface area. They look great and are built to last. No cheap clip & magnet design. I'm very happy with our purchase!